What Did My Day Sound Like? Today I was given an ear bud with three preset channels in preparation for listening to the Chinese to English Interpreters. I am pretty sure there are teachers back home showing the kids sfuff that I am experiencing so I’ve included a sample to listen to. 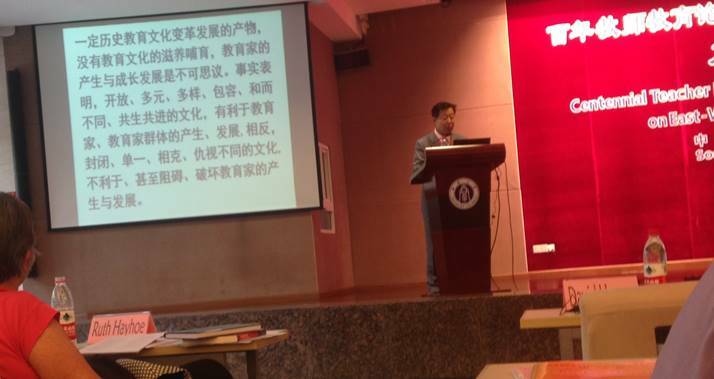 There were 11 speeches (as they called them) 8 of which were delivered directly from the heads of Universities in China about the status of Teacher Education and Educational Outreach to communities in distant and remote places in the country. Serious planning has to be considered when you are a nation of 1.4 Billion people. On top of the population issue is the fact that China just announced (March, 2016) that the “One Child Policy” was abandoned and families can now have two children legally. Kindergarten teachers are in high demand. I understand from some kindergarten teachers here in China that they have updated the curriculum so that children understand what it means that their mothers are pregnant and expecting. The system worked seamlessly. There was one catch… Read the PowerPoint on screen….. The First Day of School at Kingsville Public School!